The EU has engaged in a large-scale global reform by proposing an investment court system as a means to address concerns about ISDS. The new proposal will certainly have certain impact on Asian countries in their FTA negotiations with the EU. This article analyses the key features of the investment court system, looking mainly at the CETA, EU-Vietnam FTA and TTIP texts for guidance, as well as how the EU’s proposal raises novel challenges. 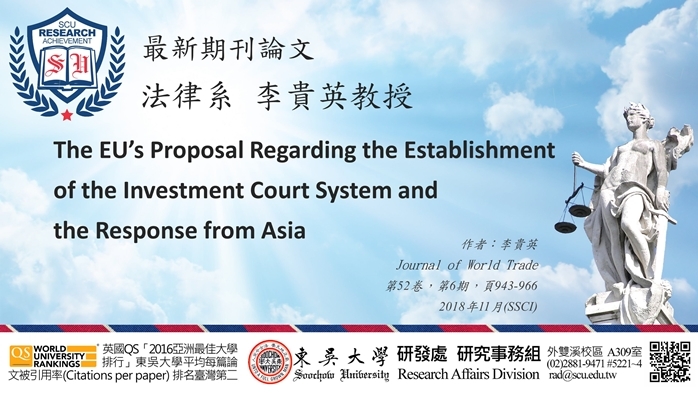 This article addresses, first, the EU’s reformed approach of investment dispute resolution and the repercussions from Asian countries; secondly, concerns which may persist in weighing the new court model and the existing investor-state arbitration system. Some Asian countries have been following very closely the new trend and raise a number of specific questions. It would be very interesting to understand the concerns of the Asian countries and analyse their current positions as well. It seems that Asian countries need to consider key elements concerning its establishment, including the need to build consensus among states, institutional aspect of the new permanent structure, issues relating to the decision-makers, and financial resources at stake. To sum up, the proposed reform is neither fully opposed nor fully supported.